SHO-ME PAR 36 LED LIGHT. Replaces conventional halogen and incandescent PAR 36 bulbs. 16 high-intensity LEDs in each Standard PAR 36 light. Clear lens with amber,blue,green,red,white LEDs - specify. 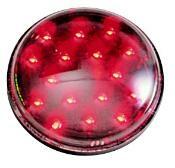 Can be used with a optional LED flasher (see flashers). Also various optional mounts are available (see accessories). Standard PAR 36 light: 1 1/4"H x 4 5/16" Diameter. / 3.5 oz., 12 Volt / 0.2 amps max. Wired with 18" pigtail.